As we've discussed in this blog, rainwater is pure and doesn't need purification before drinking, if the catchment is clean and the water is fresh. But if the rainwater has been sitting outside for a while it needs to be purified. The surprising thing most people don't know is that water can purified for free thanks to the power of the Sun. 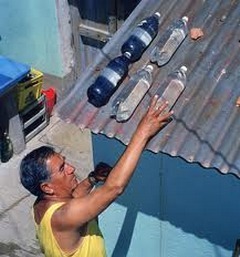 The technique is called SODIS which is short for solar disinfection. And all you need to do it put the water in a recycled PET bottle and put it on a shiny metal surface (to increase the exposure) for 6 hours. During this time, the UV-radiation of the sun kills any harmful bacteria which may be in the water. The water is then ready to drink- it's that simple. In our view, this makes SODIS superior to chlorine (the other common disinfection method) and ozone because it is 100% renewable and free, of course.